BOOK OF HOURS -Leaf on vellum from a French manuscript Book of Hours. BOOK OF HOURS - Leaf on vellum from a French manuscript Book of Hours. Title : Leaf on vellum from a French manuscript Book of Hours..
Map maker : BOOK OF HOURS. Size : 6.3 x 4.3 inches. / 16.0 x 11.0 cm. 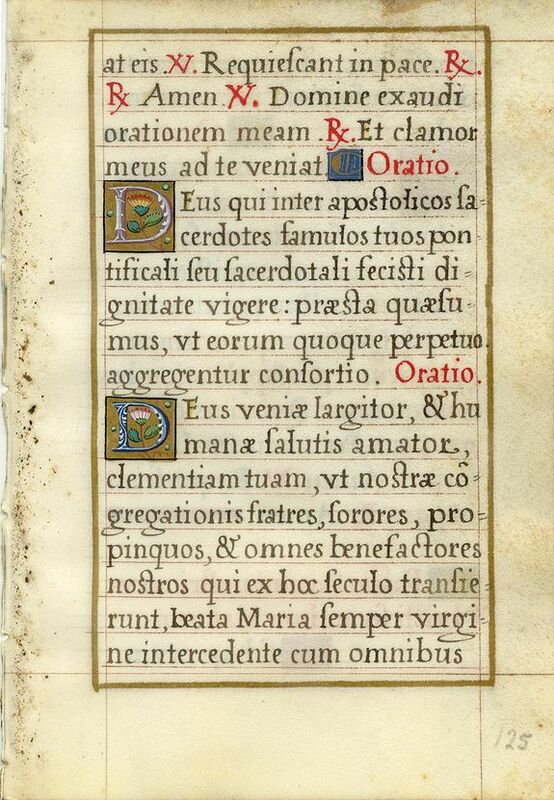 Description :A wonderful vellum leaf from a Book of Hours, written in Paris, around 1570. The scribe used dark brown ink and wrote in a fine rounded roman hand. The initials are in bright colours and liquid gold: the large one has a very pretty painting of leaves and flowers with white heightening on a liquid gold panel. Both sides are within a gold ruled frame.